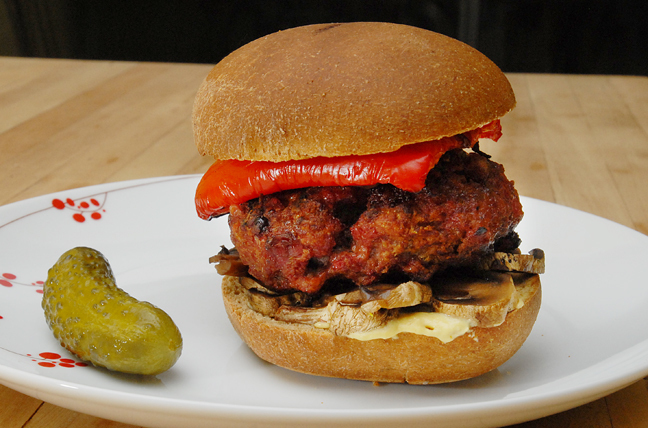 Here is a great substitute to beef hamburgers with the same amount of flavor, but less fat. Well until the addition of sauteed mushrooms and homemade aioli sauce. Mix meat with egg and season with sage, salt and pepper. Add enough breadcrums to form a rough mass. Form mass into three large or four medium patties. Grill burgers and pepper over barbecue. Top with mushrooms and aioli. This entry was posted in Dinner, Food, Recipes and tagged barbecue, deer, game, meat. Bookmark the permalink. I like the layers of mushrooms and red pepper. A venison burger…I don’t think I’ve ever had one of those. I like the sound of homemade aioli sauce too. Happy Valentine’s Day! Gotta have the pickle! Yum. Happy V-day to you both. We have a lot of venison in the freezer (from my Dad, who kills them with bow & arrow, I think) which needs to be moved given the 1/2+ of pig that Steve brought home today, so thanks for the inspiration. Hope y’all had a happy Valentine’s Day! You guys really know how to make a burger! This looks fantastic! Ooh, now this is a burger I could sink my teeth into. That’s the name of the place? I love it. I am going to add some sage to my next venison dish – thank you! Glad you mentioned that that was an extra large pickle, I was about to comment about how cute and small your burger was ! Looks delish. Fantastic – can I have one for my breakfast please?! You are making me wish my grill wasn’t put away for the winter. A delicious sounding burger. Nice burger! I no longer have a source for venison, since the old hunter who used to bring it to me ‘retired’….but this would dress-up some lean ground beef, too! Haven’t tried venison as burgers before, but seems like a great idea. Did you have to cook it on lower temp or more medium doneness to keep it from drying out? Or did the egg help with that? I know bison can be that way because of how lean it is. We’ve been having trouble with our charcoal, I think it got wet. So the fire was probably lower! But since we grilled it, I’m not sure. The egg helped hold it together, not a lot of fat. I wish I could find some venison to purchase. Did you use elk or deer meat? I also wonder if venison is lower in cholestoral like Buffalo. Anyway, love the mushrooms and the aioli. Great looking burger. Deer meat. I’m not sure about the cholesterol but it is a lot leaner than beef. Venisonnnnn one of my favs, especially with mushrooms! wow…now that is an open-wide, take a bite, burger!! Looks great, I love venison. But come on, only one pickle on the plate:)? More pickles!! Oh Boy! I can’t wait until one of my hunter friends delivers the next batch of venison. My mouth is already watering! I bet JT would love these, he just adores venison. I’ve had bison burgers which are also lower in fats than ordinary beef, but never venison. That looks like a mean burger, Greg. Nice pickle. Man! I need to get my hands on some venison. I’m going to Montana this summer for a friend’s wedding and I’m hoping to try a bunch of game burgers … venison, bison, what-have-you. But I want this one NOW. Very nice and simple recipe. Anyone can die for it.. The only thing I can say about this burger is.. I am in Love! Looks delicious … I love venison, though I’m not into such large pieces of cooked pepper. We’re hoping to bag a deer next season. I’m tired of them eating my vegetable garden. Venison burgers are good. That pickle looks good, too. We love pickles and burgers. We used to always have venison in the freezer when we lived on the farm. Love venison! These look fab…..
Sooooo wanna ship me one for lunch today?? Seriously. All joking aside. Looks amazing!